Change things up with these side-trips from Cairns: Palm Cove (Palm Cove Beach, Hartley's Crocodile Adventures, & more) and Port Douglas (Safaris, Wildlife Habitat Port Douglas, & more). Spend the 17th (Mon) among aquatic life with a scuba or snorkeling tour. The adventure continues: hike along Esplanade Boardwalk, brush up on your military savvy at The Australian Armour & Artillery Museum, pause for some serene contemplation at St Monica's Cathedral, and view the masterpieces at Bones and Jones. To see maps, where to stay, traveler tips, and other tourist information, go to the Cairns trip itinerary builder app . Zurich, Switzerland to Cairns is an approximately 23-hour flight. You can also do a combination of train and flight; or do a combination of train, bus, and flight. The time zone difference when traveling from Zurich to Cairns is 9 hours. Traveling from Zurich in June, expect a bit warmer with lows of 22°C in Cairns. Finish up your sightseeing early on the 25th (Tue) so you can travel to Brisbane. You'll find plenty of places to visit near Brisbane: Warner Bros. Movie World (in Oxenford), Sea World Theme Park (in Main Beach) and Surfers Paradise (Surfers Paradise Beach, Infinity Attraction, & more). Pack the 4th (Thu) with family-friendly diversions at Dreamworld. Next up on the itinerary: stroll around South Bank Parklands, admire the natural beauty at City Botanic Gardens, identify plant and animal life at Lone Pine Koala Sanctuary, and explore the activities along The Brisbane River. 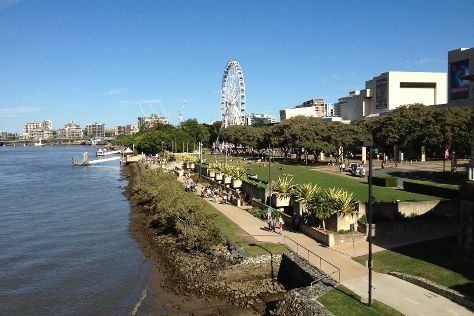 To find photos, maps, ratings, and other tourist information, read our Brisbane trip itinerary tool . You can fly from Cairns to Brisbane in 5.5 hours. Other options are to do a combination of flight and bus; or drive. In June, Brisbane is a bit cooler than Cairns - with highs of 24°C and lows of 13°C. Finish your sightseeing early on the 5th (Fri) to allow enough time to travel back home.